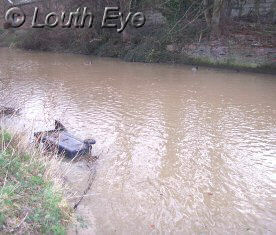 High winds battered Louth on the afternoon of January 18th, with gusts reaching around 80mph. 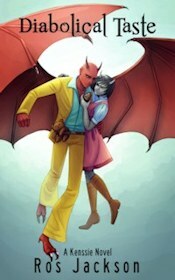 This was enough to cause some structural damage to buildings, as well as power cuts. 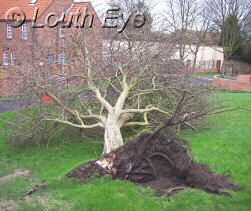 Pictured left is a hawthorn tree in Springside that fell in the gales. This was not one of the trees earmarked for felling earlier in the year by ELDC, as part of the Springside Regeneration Project. 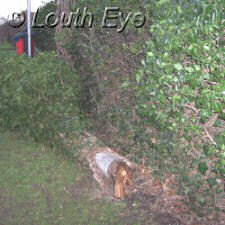 Pictured on the right is an ivy-covered pole on Eastfield Road that was brought down by the winds. The canal was swollen with sediment and debris as a result of the rains that preceded the high winds, softening the ground. Snow and ice scenes from around the town. 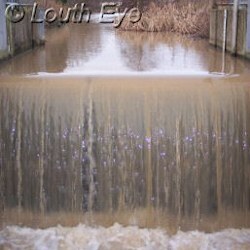 Severe flood warnings are issued for the Louth Canal and the river Lud. Shops closed early and people fled to the Hills as the cold snap brought deep snow to the town.